Once the certified technician at your Interstate Transmission Company of Auburn Massachusetts, completes a thorough external diagnosis, if your vehicle’s transmission problem can not be corrected by adjustments external to your manual transmission, an accessible transmission or clutch component, or a Reseal Service, then Interstate Transmission Company will be recommended to you. Thorough cleaning and inspecting of your transmission’s internal and external components by Interstate Transmission Company technicians. From experience, Interstate Transmission Company’s technicians know which parts always need to be replaced and they’ll be replaced with new, reconditioned, or rebuilt components. This includes numerous gaskets and seals, bushings, bearings, and soft parts. All hard parts (such as the gears), including your clutch, pressure plate and flywheel, will be inspected for excessive wear or damage and also be replaced as necessary. In many, if not most cases, your vehicle manufacturers updates will recommend that additional transmission components need to be replaced, and those components will be replaced with reconditioned or new components. The transmission is then reassembled to factory specifications, reinstalled with any necessary adjustments made, and the fluid refilled to the full level with fresh, clean fluid. Your vehicle is then road tested to ensure all of the problems you noticed prior to your Interstate Transmission Company service are corrected, and your car, truck or SUV is ready to go for miles to come. Your manual transmission will have been rebuilt to Interstate Transmission Company and Repair’s exacting quality standards, and your Interstate Transmission Company will get you back on the road as quickly as possible. Many times, the result of the Interstate Transmission Company External Diagnostic Service determines that a vehicle’s problem is a malfunction in an accessible transmission component or an external transmission-related component. In this case, the problem can be corrected by making an adjustment, repair or replacement while your manual transmission is still in place, returning the transmission to normal operation. It takes an expert to tell-that’s why every vehicle that visits an Interstate Transmission Company with symptoms of a transmission problem is put through Interstate Transmission Company and Repair’s comprehensive External Diagnostic Service. Because Interstate Transmission Company knows the right diagnosis is everything. If the thorough external diagnosis, performed by the Interstate Transmission Company certified technician, shows that your vehicle’s only problem is that your transmission is not retaining transmission fluid, and there are no drive-ability problems, an Interstate Transmission Company Reseal Service may be recommended to you. The transmission is reinstalled, fluid refilled to the full level with fresh, clean transmission fluid, and any external adjustments are made as needed. Your vehicle is then road tested to ensure the transmission is in top working order, and your car, truck or SUV is ready to get back on the road. Clutch Service is recommended when the results of Interstate Transmission Company comprehensive External Diagnostic Service show that a clutch problem that cannot be corrected by external adjustments, repair or replacement of a clutch-related component. Inspection of the clutch disc, pressure plate, flywheel and related components. Replacement of any required components to meet Interstate Transmission Company standards. Re installation of the transmission. Refilling to the full level of fresh, clean fluid. A lift check to ensure proper clutch installation and adjustment. Your vehicle is then road tested to ensure proper clutch operation. Once the certified technician at your Interstate Transmission Company and Repair center completes a thorough diagnosis, if your vehicle’s problem cannot be corrected by adjustments or repairs external to your automatic transmission or by a Reseal Service, then repair service will be recommended to you. From experience, Interstate Transmission Company and Repair center technicians know which parts always need to be replaced – generally filters and those made from soft materials that wear such as rubber, paper or cork – and those components will be replaced with new components. In many, if not most cases, your vehicle manufacturers updates will recommend that additional transmission components need to be replaced, and those components will be replaced with reconditioned or new components. Once rebuilt, the transmission is reinstalled, fluid refilled to the full level with fresh, clean transmission fluid, and any external adjustments are made as needed. 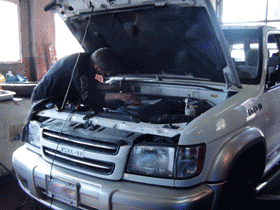 Your vehicle is then road tested to ensure all of the problems are repaired professionally. Your transmission will have been rebuilt to Interstate Transmission Company exacting quality standards. Interstate Transmission Company and Repair External Diagnostic Service. Our Centers’ certified technicians can get to the bottom of any transmission problem. With today’s more complex, computer-controlled transmissions, it takes a real expert to be able to diagnose a transmission problem correctly. Getting that diagnosis right can save you money. Diagnostic Service is a systematic and comprehensive external evaluation of the overall performance and condition of your transmission. Contaminated fluid has water or particles in the fluid. Burnt fluid indicates damage from overheating. Varnished fluid has been overheated repeatedly. 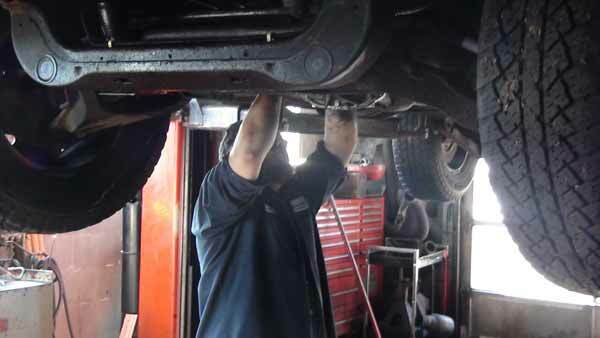 The technician will also check the level and condition of transfer case and differential fluid, where applicable. noticed, and to evaluate your car’s performance. cause of the problem external to the transmission. Finally, the technician will scan the computer for trouble codes*. From these tests, the expert transmission technicians at Interstate Transmission Company and Repair centers can determine what type of problem you might have, and make a recommendation for whatever service is necessary.